Introducing a new exhibition is always an exciting experience. There seems to be a general buzz within all departments of the museum in the weeks surrounding an opening. It is particularly exciting working in the Make Your Own Glass department. 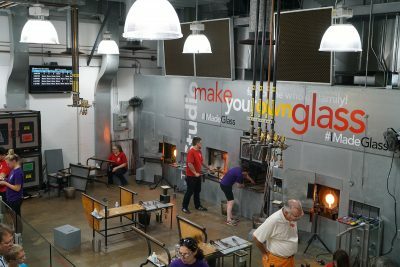 Make Your Own Glass (MYOG) is a workshop located inside of The Studio where museum visitors can purchase tickets for a 40-minute glassmaking experience. Experiences range from flameworking to fusing to glassblowing with options available for all ages. When a new exhibition is being installed we are presented with the opportunity to create a corresponding project. A lot of planning goes into creating a project for the Make Your Own Glass department. First, we design the physical piece. Then we work out what our role is relation to our guest’s role, how much time it takes to complete the design, the ease of creation, and if there is any preparation that needs to be done beforehand. Detail of panel, The Prayer of the Christian Soldier, 1919. (British, b. Ireland, 1858–1932). Glass mosaic. 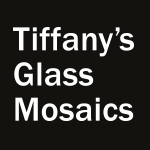 Tiffany’s Glass Mosaics presented a unique challenge for MYOG. 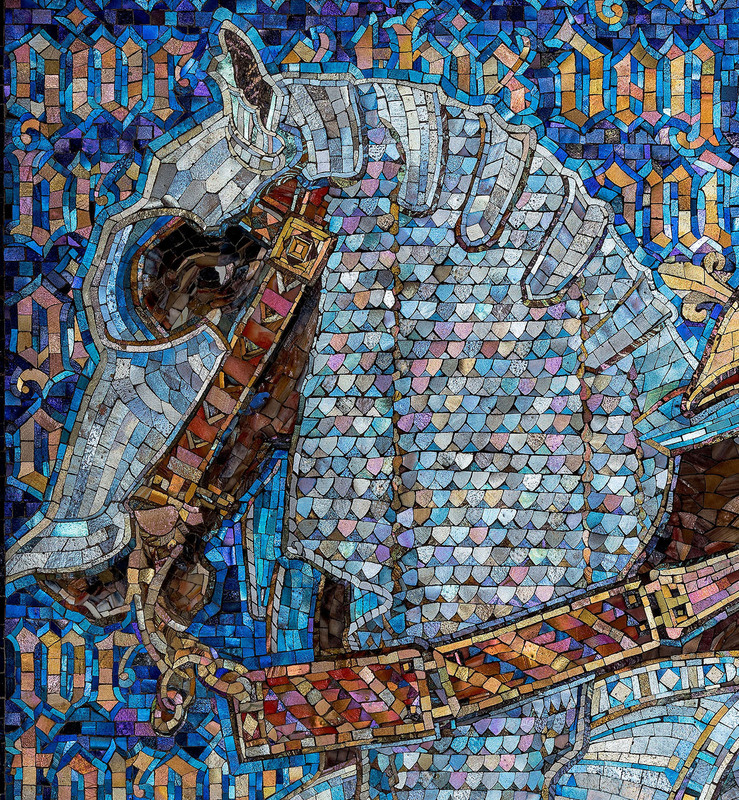 How do we create a mosaic project without requiring our visitors to apply the traditional, and time-consuming, mosaic-making process? 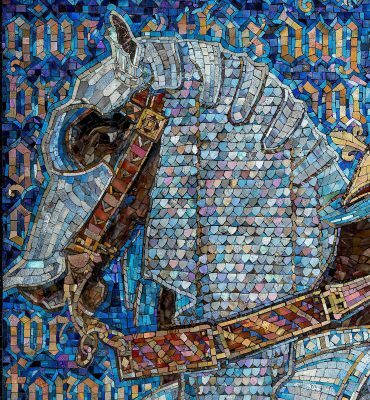 Typically, mosaics are made by either directly pressing small pieces of glass or stone into a mortar or cement to create an image, or by first creating the picture and then filling in the spaces with mortar. (Learn more about the process Louis C. Tiffany’s artisans used.) We wanted to offer a project with the same visual outcome and process of making a mosaic, without the complication of using mortar. Glass fusing seemed to be the logical route. Like mosaic making, glass fusing is done by arranging small pieces of glass together to create a design. However, instead of using mortar to hold it all together, the glass is put into a kiln and melted, or fused. Cartoons inspired by Tiffany’s mosaics. While learning about the process that Tiffany’s studios used to create mosaics, one step jumped out at me. The mosaics are assembled on top of a cartoon, or template, to help guide the cutting of exact shapes and sizes. To bring a mosaic “feel” and a little guidance to the fusing project, we created cartoons inspired by the imagery in Tiffany’s mosaics: geometric patterning and natural themes. I was particularly drawn to the image of a dragonfly which can be seen in Tiffany’s leaded glass lampshades, mosaics, and fancy goods. It is an image that, to me, says “Tiffany,” and I knew it needed to be one of the cartoons. I was also really inspired by the theme of the large-scale mosaic, The Dream Garden, and came up with a butterfly cartoon. Even though there are no butterflies represented in the mosaic itself, I imagined a landscape filled with fluttering butterflies. However, a great deal of Tiffany’s mosaics were geometric patterns, and I wanted to represent those design ideas as well. The geometric cartoon is a simple pattern that really becomes unique to whoever is selecting the glass and making the mosaic, which is also a theme to be explored in Tiffany’s Glass Mosaics. The final MYOG project that combines all of these elements is a fused glass plate. You begin the project by choosing from one of three mosaic-inspired cartoons. We provide a wide variety of glass pieces for you to choose from to create the design. 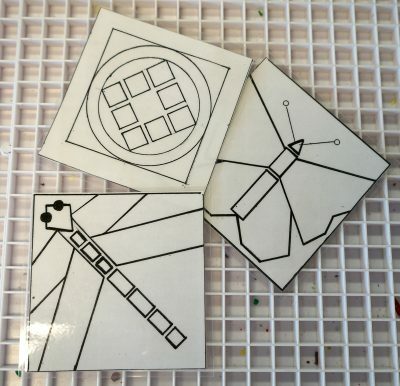 The cartoon is placed under a clear glass tile and you can try your hand at glass cutting and selecting to complete your mosaic-inspired fused plate. Of course, you could get inspired from the Tiffany’s Glass Mosaics exhibition and bring your own ideas to the table too! 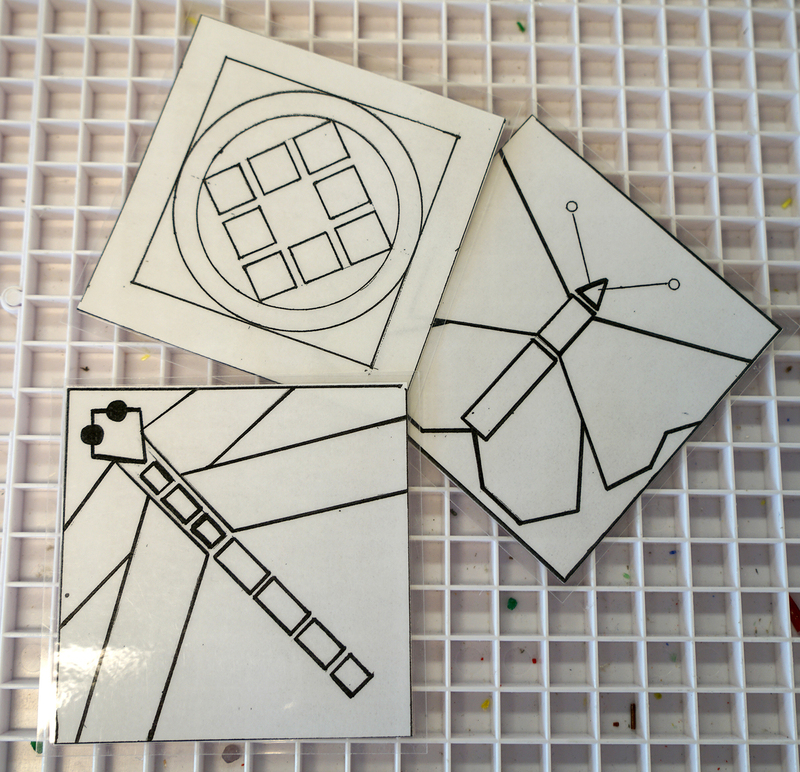 The Make Your Own Glass Tiffany Inspired Fusing project is available through January 7. We highly recommend making reservations in advance as these activities are very popular. Kalli Snodgrass is the workshop coordinator for the Make Your Own Glass workshop inside The Studio at the Corning Museum of Glass. She works with museum visitors to help them create their own masterpiece of art glass. What size if we want to work on our own template design? Great question! The template should be 4in by 4in. Hi there? Is the Make-Your-Own Tiffany mosaic still available? I have tried several dates and I haven’t seen it listed to choose. I am still having trouble so I will call the center. Thank you. Hi Michelle – If you click this link: https://www.cmog.org/visit/make-your-own-glass/tiffany-inspired-fusing, then Buy Tickets, on the next page you will choose your dates, then on the page after that, you will choose your project. In the Fusing section, select Small Glass Fusing. If you still need help, please email me at web@cmog.org. Good luck!